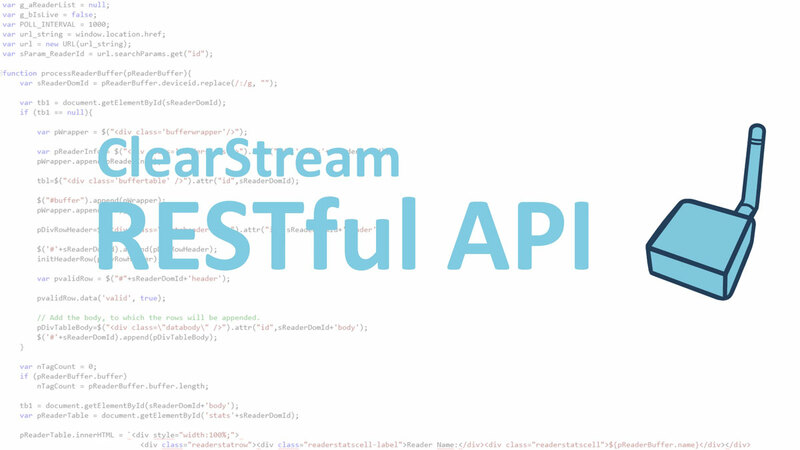 ClearStream’s RESTful API offers developers the ability to add RFID and Bluetooth Beacon technology into existing applications or websites. Through this API, full control of readers and Bluetooth gateways are given to the outside application. Turn readers on or off, power on GPO outputs such as light stacks and alarms, and see the RFID tags, or Bluetooth Beacons that the ClearStream application is reading, in real-time. Control Devices: Turn on or off devices in the field, power on GPOS, and send the current status of a reader or gateway to the mapped database. View Tags and Beacons in Real-time: See what the reader or gateway is reading as the data is being collected, modify this data and send it to the database after it has been validated. Real-time Location: Since you have access to all of the activity of your tags and beacons in real-time, use the API to determine a location of your beacon and display it in an outside application or web page. A RESTful API is an application program interface (API) that uses HTTP requests to GET, PUT, POST and DELETE data. Also referred to as a RESTful web service, a RESTful API is based on representational state transfer (REST) technology, an architectural style and approach to communications often used in web services development.